Americans for the Arts Public Art Network (PAN) develops professional services for the broad array of individuals and organizations engaged in the expanding field of public art. Promotes information exchange, research and critical dialogue within the field of community-based art. ArtsOpportunities is an online classifieds bank serving the Arts industry. From full-time and part-time positions, to internships, to submission calls and auditions, ArtsOpportunities allows artists and arts administrators to search for opportunities by arts-specific criteria and allows employers to post to a targeted pool of applicants. Public Art 4Culture compiles a list of current public art opportunities available through Public Art 4Culture and other agencies across the country. Public Art Review is the only journal focused on exploring the many dimensions of public art. Each issue provides opinion, analysis, criticism and discussion about the nature and trends in public art. Estria Miyashiro, Unity (detail), 2006 acrylic paint on nonwoven media, 9 x 40 feet. 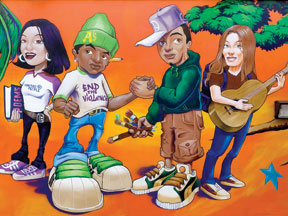 Located at the Alameda County Juvenile Justice Center. This artwork was funded through Alameda County’s “2% for Art” public art ordinance. Photo: Sibila Savage.